Influenced by a sympathetic activist who believes every one deserves a second chance and that positive attention will improve, if not restore, a person’s social poise, the wealthy Lady Denison, and her daughter, Margery, make a practice of inviting the most demanding, disagreeable, and difficult people in England to their country home, Prior’s Ashton, where food, tea, lovely walks, and allegedly good company await in abundance. Guests may stay as long and be as horrible as they like. All is tolerated by the Denison women, who receive heaps of praise from their philosophical advisor, Basil Hylton, and heaps of abuse from the loquacious military man, insistent German teacher, and fussy snob to whom they are thoroughly gracious hosts. St. John Hankin employs these characters in a sharp send-up of fads and do-gooding, “The Charity That Began at Home,” which continues the Shaw Festival’s laudable habit of producing little-remembered curios that were written during the lifetime of George Bernard Shaw (1856-1950). Hankin tries for, but doesn’t quite achieve, Shavian bite in his comedy that comes to a head when Margery becomes engaged to one of the guests who would be unwelcome in any other upright British home and who could jeopardize, or at least reduce, Margery’s standing in society. Even the unstintingly charitable Lady Denison blanches at the intended marriage and is encouraged to take action to thwart it by her sister-in-law, Mrs. Eversleigh, an amiable and wanted visitor to Prior’s Ashton, who often serves as the voice of reason in Hankin’s play. 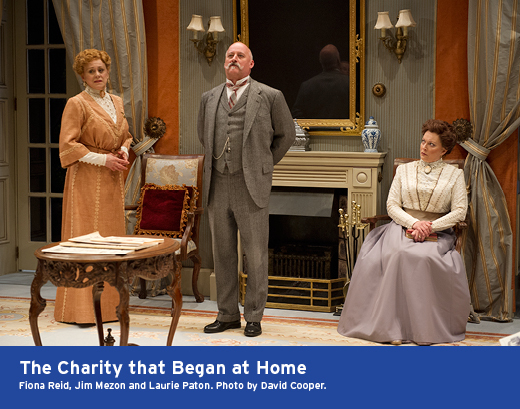 Bite or no bite, “The Charity That Began at Home” is effective in Christopher Newton’s production for the Shaw. That’s because the plot and its consequences are engaging enough to create curiosity and hold attention, but even more because Shaw actors — Fiona Reid, Laurie Paton, Jim Mezon, Graeme Somerville, Martin Happer, and Sharry Flett — deliver Hankin’s lines with entertainers’ skill that ekes every laugh and bit of sarcasm out of them. Reid flutters amiably in her confusion about what to about Margery’s plans to wed while Paton looks askance at each gauche act of the Denisons’ guests, and Mezon, Flett, and Donna Belleville provide ample gaucherie for her to observe and disapprove. Meanwhile, Happer is winning Margery’s affection, and Somerville, as Hylton, basks in the glory of the forgiving benevolence he has fostered. Situations and acting keep things amusing in Newton’s staging. Hankin makes his point about going overboard with generosity, but his approach is staunchly straightforward. He doesn’t have the dashing comic touch of Shaw or Noel Coward. Exchanges between characters are not particularly witty and reveal a lot you’ve already gleaned by the Shaw casts’ shrewd portrayals. Dialogue is to the purpose and doesn’t contain the arch wordplay or exquisite one-liners of others from this period (1903). Though Hankin doesn’t aim for frothiness or maintain the urbane comic brio of his Edwardian contemporaries, he does make you see how charity can go too far and become more of a foible than a blessing, and he is able to illustrate his point by creating some truly repugnant characters with which Newton’s ensemble has a field day. In less capable hands, “Charity” may play as stilted or overwrought. The Shaw company finds just the right touch, so Mezon’s pompously obnoxious soldier becomes a larger-than-life figure, destined to cause constant tedium instead of a bellicose crashing bore, and Happer’s character’s criminal past is obscured by the disarming ease he must have used to wiggle his way out of terms in jail for embezzlement and swindling. Hankin owes much to Newton, Mezon, and the entire Shaw cast for their approach to his material. The playwright provided a promising premise. Pure theater craft brings it to life and turns what could have been mediocre mush with some good ideas and welcome torpedoing of blind altruism into an effervescent treat that provokes thoughts about what separates legitimate philanthropy from doing good for the sake of show. The Denisons are not looking for credit beyond the approving words of Basil Hylton. They keep their mission a secret, lest their guests are insulted to learn they were chosen for being pariahs, and are sincere in wanting to help the bad mannered and ungrateful to social acceptability. They totally buy into Hylton’s campaign to show kindness to the rejected, but even Lady Denison admits she gets a tad weary of tending to the stodgy and exacting among her guests, the ones who are more burdensome and offensive than they are fulfilling to entertain. Margery is much more caught up in Hylton’s web of magnanimity than her mother is. While Lady Denison clearly notes but sweetly overlooks flaws in her guests’ behavior, Margery has no cognizance of them at all. Even Sharry Flett’s grueling German teacher, Miss Triggs, does not daunt her or make her want to sow shrew repellent around the Prior’s Ashton premises. Newton creates a civilized circus in which the horrid guests come and go while Lady Denison, eyes opened by Mrs. Eversleigh, frets about her errant charity, and Graeme Somerville’s Hylton waxes poetically and rhapsodizes over the Denisons’ warmth while communicating in small ways that he knows there’s some humbug to his preaching of human compassion, especially after Margery, to whom, and to whose wealth he takes a fancy, announces her betrothal. If Hankin is not the wordsmith that Shaw or Oscar Wilde is, he is enough of a critic or commentator to know, and expose, the difference between sentiment and sentimentality and the distinction between worthy charity and what we today would call social engineering. 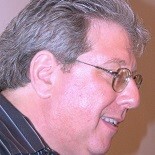 Jim Mezon is the most imposing of the Prior’s Ashton guests. His General Bonsor will grab anyone’s ear and speak incessantly about military campaigns and barracks gossip that wouldn’t interest the most thorough military historian, let alone a casual listener. When we meet the general, he has been expounding for hours to Neil Barclay’s Mr. Firket who is too polite to interrupt the never-ending discourse or flee, but who shows his pain and longing to be rid of his tormenter. The general just cannot grasp to hint to take a breath and takes umbrage when anyone attempts to interrupt his constant, uninteresting babble. Mezon’s gift is in being able to play a bore without letting his character become boring to the audience. Yes, we cringe every time the general enters. Luckily, Hankin has other things going on while the general keeps nattering away. More importantly, Mezon is so hilarious in the bombast he gives his character, he makes Hankin’s point about one person’s tediousness artistic via his portrayal. The general is also a stickler for time and complains bitterly if a scheduled meal is a minute late or some other guest is not ready to partake the instance luncheon and dinner is served. The general lives up to Hankin’s, or anyone’s, definition of “disagreeable.” His moralism, and indignity at being told he’s a windbag by Happer’s Hugh Verreker, adds to the general’s repellant characteristics, all of which Mezon plays brilliantly. Sharry Flett gives no quarter when her character, Miss Triggs, a spinsterish teacher of German who can’t muster enough steady pupils to eke an income, wants something. The Prussian Triggs teaches comes out in her personality. Flett is especially funny when she has Miss Triggs shouting at someone for not preparing properly for his or her German lesson while crying in sorrow at the ill treatment a missed appointment causes her. Donna Belleville, looking particularly plump and self-satisfied, scores with a portrayal of Mrs. Horrocks, a woman with no tact or charm who believes she is the nonpareil of decorum and social correctness and is more than willing to lord her assumed superiority over anyone and everyone. In supporting roles as servants in the Denison home, Andrew Bunker is neatly unapologetic while appearing to be the model servant when he is accused of belittling one colleague and impregnating another; Darcy Gerhart is genuinely touching as the woman Bunker’s character taints and makes her lady’s maid an important figure in the action; and Edmund Stapleton is perfect as a dedicated young footman who longs to do well but is also upset and driven to leave Prior’s Ashton by Bunker’s character, who was given his job as part of Hylton’s experiment in humanity. Fiona Reid is the quintessential Edwardian doyenne. Her Lady Denison want to be decent and wants to use her more than sufficient fortune for the betterment of mankind. She doesn’t always enjoy being host to the most distasteful people in society but she gets overall pleasure from her charitable gesture. Reid shows the extent of Lady Denison’s personality when dealing with the household scandals her butler causes and the engagement of her daughter to a proven, and admitted, scoundrel. You see the maverick at war with the conventional British noble and know, that for all of her humanitarian effort, Lady Denison is mindful of propriety and social decorum. Laurie Paton is stalwart as Mrs. Eversleigh, who comes to stay with her sister-in-law and niece as the one guest who is not a recipient of charity and works to open Lady Denison’s eyes and to put her do-gooding in perspective. Paton is an admirable raissoneuse, quickly showing disdain for Hylton’s teachings and what they have wrought on Prior’s Ashton, and earnestly leading Lady Denison to a more sensible, and more pleasing, path. The actress knows just how to make her character’s opinions prevail without being pushy or overbearing. Julia Course is a lovely Margery, who you see at a glance is dedicated to the good works she and her mother perform and is truly proud of giving the unwanted a nice stay at a pleasant country manse. Course also shows Margery’s mettle by standing by the man who has proposed to her even though her mother, aunt, and spiritual guide, Hylton, are aghast at her choosing a would-be convict for her mate. Course illustrates the dignity and altruism of benevolence. She has none of her mother’s doubts or regrets, and she goes about Margery’s business with sunny good will and sincere interest in each guest, no matter how unpleasant some of them can be. Martin Happer is having a great year at the Shaw. His Sergei in “Arms and the Man” is a wonderful combination of bluff, bluster, and self-realization. His Hugh Verreker in “Charity” has no qualms about explaining how one dishonest act led to others, how his criminal tendencies ruined his otherwise promising military career, and how he should, by all rights, be lodging in a prison cell rather than in Prior’s Ashton with all of its comforts. The way Happer expresses Verreker’s misdeeds makes his character come across as the most authentic and trustworthy person on stage (though Margery and Mrs. Eversleigh are rivals for that accolade). Happer not only conveys charm, he convinces you Verreker’s thieving was situational and part of the past. His Verreker also has the good taste to mention he is not unaware of Margery’s money while persuading us that he is just as interested in her qualities as a woman as he is in her position as an heiress. His Hylton keeps brash and confident is his philosophy. He never simpers or cloys. Nor does he recant any of his ideas and teachings, even when they mean he will not be the nearest to the woman he adores, Margery. Hylton is a romantic who lives to perform good works and gushes with sentimentality but who, with a gun to his head, would admit to some chicanery. Somerville has many fine moments, but two that stand out are his outpouring of praise when he talks about the worthwhile charity Lady Denison and Margery carry out and when he turns a bit from his own precepts by standing with Lady Denison, Mrs. Eversleigh, and a most indignant General Bonsor against Margery’s impending marriage to Verreker. William Schmuck’s set and costume blissfully show the world of the Denisons and make you want to be invited as a guest at Prior’s Ashton. Louise Guinand’s lighting is appropriately sunny, evoking pleasant days in the country. This entry was posted on August 20, 2014 by nzoren in Theater Previews and tagged Canada, Christopher Newton, Comedy, Donna Belleville, Fiona Reid, Graeme Somerville, Jim Mezon, Julia Course, Laurie Paton, Martin Happer, Niagara-on-the-Lake, Ontatio, Sharry Flett, Shaw Festival, St.John Hankin, The Charity That Began at Home.